Conventional approaches to photolithography are usually based on exposing through a chromium-glass mask manufactured by specialist vendors. In R&D environments it is often necessary to change the mask design frequently. Direct-write laser lithography overcomes this problem by holding the mask in software. Rather than projecting light through a physical mask, direct-write laser lithography rasters the sample beneath a number of computer-controlled lasers, each pulsing on and off in order draw the pattern to be exposed directly onto the photoresist. 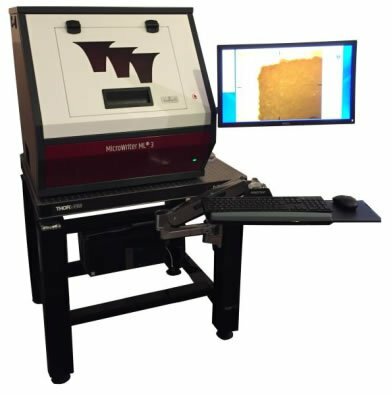 MicroWriter ML2 is a new design of direct-write laser lithography machine which combines the flexibility of maskless direct writing with high speed and low cost. 1mm – 200mm sample size. Up to 180 square-mm per minute writing speed. 405nm exposure wavelength suitable for G- and H-line and broadband photoresists; 375nm available as an option. Wide field of view optical microscope and high resolution scanning laser microscope for alignment of exposure to existing structures. Infra-red microscope for double sided wafer alignment available as an option. ´Turbo´ exposure mode in which eight 5µm resolution lasers work in parallel to exposure large areas at high speed. Supplied with professional mask design software Clewin 5. Realistically priced for University and industrial R&D budgets.